A datum in general is a reference point, surface, or baseline from which measurements are made. Naturally, there needs to exist consistent and standard regional or global reference frames for locating features on earth. As an example, the height of a local mountain is determined by measuring from which surface? the base of the mountain, center of the Earth, closest water body, or the town mayor&apos;s house? Similarly the position coordinates of a point on the surface of the earth needs to be determined based on some frame of reference, raising the question of how to align coordinate system grids over the Earth&apos;s surface. Consequently two types of datums are defined: vertical datums are used as a reference from which elevations and depths are measured; and horizontal datums act as base reference for measuring locations on the surface of the Earth. Both of these reference frames are dependent on the way the size and shape of the Earth is represented. Different models of the Earth produce different datums, and therefore affect the value of a location&apos;s elevation and position (coordinates). Consequently, an understanding of the shape of the Earth and different ways of representing it is a prerequisite to any discussion of datums. Representing the shape of the Earth with all the variation of its complex surface topography (e.g. mountains and valleys) would be an impossible task. An entire branch of science, called geodesy, is dedicated to the study of the shape and size of the Earth. Geodesists have defined two main models or reference surfaces, namely geoid and ellipsoid, to approximate the Earth&apos;s shape. The geoid is shaped by the Earth&apos;s gravity field. It is an equipotential surface of the gravity field, indicating that the gravity potential is constant and the direction of gravity is perpendicular at every point on this surface. This would be the surface if the oceans were to flow freely and cover the entire earth (in the absence of winds, tides and currents). The surface of the oceans would align with the surface of the geoid. The geoid is the best global approximation of the mean sea level (MSL) which is used as a reference in calculating elevations of features. In reality the geoid and mean sea level do not coincide due to such factors as ocean currents, water temperature, salinity and air pressure variations. The separation between the geoid and mean sea level is referred to as sea surface topography (SST) or ocean surface topography with ranges between -2m to +2m globally. The Earth&apos;s mass is not distributed evenly; therefore parts of the Earth are subjected to stronger gravitational forces than others. 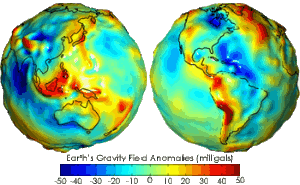 Gravity anomaly maps show the gravitational force variations over the surface of the Earth. In terms of the shape, greater density (relative surplus of mass) causes positive undulation, while relative deficit in mass causes a dip in the surface of the geoid. As a result the geoid (and the mean sea level) has an irregular shape characterized by an undulated surface with bulges and dips. The Earth&apos;s gravity field is measured on land (using gravimeters) and from space. Over the past decade, satellite measurements such as the GRACE (Gravity Recovery and Climate Experiment - video) and GOCE (Gravity Field and Steady-State Ocean Circulation Explorer - video) satellite missions have enabled global gravity measurements, providing detailed mapping of the geoid with high accuracy and improved geoid models of the Earth. As was seen above, Geoid has a complex irregular shape that is not easily defined mathematically. As a result, a simpler, more practical model of the earth is employed in order to be able to align a coordinate system grid with a representation of the Earth&apos;s shape. A simple model of the Earth is a sphere. However the Earth bulges at the equator (flattened at the poles) due to the centrifugal force of rotation, therefore a more accurate model for its shape is defined to be an ellipsoid of revolution or an oblate spheroid. An oblate spheroid is a special case of an ellipsoid obtained by rotating an ellipse about its shorter axis resulting in a squashed sphere. In this case the x and y axis on horizontal plane are equal and the z axis (on vertical plane) is shorter than the other two. The terms ellipsoid and oblate spheroid are used interchangeably in geodesy. When an ellipsoid is used to model the actual shape of the Earth (or shape of geoid), it is referred to as a reference ellipsoid. Ellipsoid has a smooth surface and, as opposed to the geoid, it can be described mathematically. Consequently a reference ellipsoid can serve as the basis for map projections. An ellipsoid may be defined by the length of its semi-major axis (equatorial radius) and semi-minor axis (polar radius). Alternatively it can be described by the length of its semi-major axis along with its flattening. Flattening (f) is the ratio of the difference between the semi-major axis (a) and semi-minor axis (b) lengths to the semi-major axis: f = (a - b) / a. Flattening value is indicative of how much the ellipsoid has been compressed. More commonly, a reference ellipsoid is described mathematically by stating the length of its semi-major axis and the value of the inverse flattening (1/f), where 1/f = a / (a - b). The value of the inverse flattening of the ellipsoidal model of the earth is close to 300. Different ellipsoid models of the earth are employed for different regions and purposes. The table below lists some common reference ellipsoids. There isn&apos;t one single ellipsoid that can best represent every part of the earth. Some ellipsoids are the best fit for the geoid for a certain region; however they can not accurately represent other parts of the world. Such ellipsoids are commonly used for a specific country or continent. Integration of data with non-matching coordinate systems from various regions would pose a challenge when working with different regionally fitting ellipsoids. An example of a regional best fitting ellipsoid is Airy 1830 used in Great Britain. 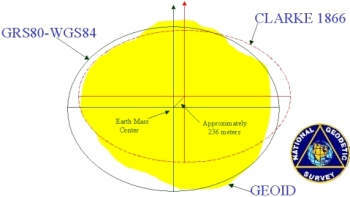 There are also ellipsoids that provide an overall reasonable representation of the geoid as a whole; one popular example is the WGS84 ellipsoid employed by GPS systems. In this picture you can see two different ellipsoids approximating the shape of the geoid. Clarke 1866 ellipsoid is the basis of NAD27 datum and a good fit for North America. As shown, GRS80 and WGS84 geocentric ellipsoids (practically equal) are better approximations for the whole earth compared to the local fitting ellipsoids, but are not the best fit for any particular region. GRS80 has replaced Clarke 1866 for the newer North American 1983 (NAD83) datum. Horizontal datum serves as a reference frame based on which location of features can be computed on the surface of the Earth. It determines how a coordinate system (e.g. latitude longitude graticule or UTM grid lines) is aligned with the ellipsoid. The horizontal datum is defined by a set of constants. These constants specify the dimensions of the reference ellipsoid (semi-major axis, flattening), the location (coordinates) of the origin of the coordinate system, as well as the orientation of the coordinate system. Also the geoid separation at the origin (see vertical datums) is stated for height measurements. The reference ellipsoid represents the earth&apos;s surface; therefore defining position of features on the ellipsoid approximates their location on the earth. Once the above parameters are defined and the origin of the coordinate system is set, reference points of known coordinates relative to the ellipsoid are established. The frame of reference points or the spatial reference frame can then be densified and extended with a network of control points. The network of geodetic control points can be global, continental, national or regional (e.g. province, city, etc.). The coordinates of any desired point can be obtained based on this datum (coordinate system and reference ellipsoid). Traditionally such geodetic network points have consisted of control monuments which where established by triangulation or trilateration surveying methods and acted as reference points for surveyors. Such surveying methods are prone to systematic errors. Today, the use of Global Positioning System (GPS) and other space-based measuring techniques provide a much more accurate means of establishing reference frames, extending the existing ones and improving their accuracies. GPS also enables calculation of heights above the ellipsoid, therefore the GPS and satellite based control networks provide a 3D reference frame from which latitude, longitude and ellipsoidal height of any other point can be calculated. Note that network of reference points do not necessarily need to be monumented and located on the surface of the earth with known coordinates. A good example is the WGS84 datum which uses the position of GPS satellites orbiting the earth as reference network. The use of Global Navigation Satellite Systems (GNSS) such as GPS, Russian GLONASS, European Galileo, and Chinese BeiDou (Compass), has enabled the addition of height data to the traditional horizontal datums. An ellipsoid height (h) is added to the positional coordinates of x and y or latitude and longitude of the control station. For example, the realizations of North American Datum 1983 (NAD 83) after 1986 (i.e. 1993, HARN, 2007, 2011) provide the ellipsoid heights and are therefore 3D reference frames. Also some reference frames provide velocity data for each control station in addition to positional and ellipsoid height data. An example of this is the International Terrestrial Reference Frame (ITRF), which is a 4D reference frame. As discussed above regarding the ellipsoid representation of the earth, some ellipsoids are a best fit for a certain region while others on average provide a better representation of the whole earth. Consequently datums can be categorized as local or geocentric depending on the type of ellipsoid they are based on as well as the value of their other constants. A local datum usually is based on a non-geocentric ellipsoid with the location of datum&apos;s origin on the ellipsoid&apos;s (earth&apos;s) surface. A local datum is more suited for a specific region or a country. An example of such datum is the North American Datum of 1927 (NAD27) with its origin located at Meades Ranch in Kansas and based on Clarke 1866 ellipsoid. With the advances of satellite positioning, more and more countries are adopting geocentric datums. These datums are compatible with GNSS technologies. The default datum for Global Positioning System (GPS) is WGS84 which is based on the WGS84 ellipsoid. North American Datum 1983 (NAD83) superseded NAD27 for North America, and is based on Geodetic Reference System of 1980 (GRS80) ellipsoid. However, NAD83 is not purely a geocentric datum; its origin is offset from the Earth&apos;s center of mass by about 2.2 meters. Vertical datum is the reference surface of zero elevation relative to which heights or depths are measured. Before discussing vertical datums, it is necessary to have an understanding of the relationship between the geoid and the ellipsoid as well as the heights relative to these surfaces. Topographic surface is the visible uneven surface of the earth, such as mountains, valleys, plains, canyons. Geoid approximates the mean sea level covering the entire earth. And ellipsoid is the smooth geometric surface providing a simpler model for the shape of the earth. Separation between the ellipsoid of reference and geoid along a perpendicular (from ellipsoid) is known as geoid height, geoid separation, or geoid undulation (N). Where there is relative surplus of mass, the geoid surface rises above the ellipsoid, and where there is relative deficit in mass, the geoid surface is below that of the ellipsoid. Therefore the value of geoid height can be positive (geoid above ellipsoid) or negative (geoid below). The height relative to the geoid measured along a plumb line to a point on Earth&apos;s surface is called the orthometric height (H); this is what is usually referred to as elevation. Ellipsoidal height (h) is the distance along a perpendicular above or below the ellipsoid to a point on Earth&apos;s surface. The angle between the line perpendicular to the ellipsoid and the plumb line perpendicular to the geoid is called the vertical deflection (θ). Traditionally the mean sea level (MSL) has been used as the zero reference surface for measuring elevations. It is determined by averaging the water level over a period of time at tide gauge stations in coastal areas. For example, the time range used in tidal datum calculations in USA is a 19-year tidal cycle (present epoch is from 1983-2001). By averaging the water level over a long period, seasonal sea level fluctuations are removed. This local mean sea level (LMSL) is a good approximation of the geoid at the particular location, therefore the height determined based on MSL are orhtometric heights. The tidal datum is a local datum. The mean sea level obtained by tide gauges is different for different locations, and an MSL chosen in this manner for a particular region can not be used as the zero reference surface for another region. Each tidal station is referenced to fixed and stable benchmarks on land. MSL is just one type of tidal datum; some other types include Mean Low Water (MLW), Mean High Water (MHW), and Mean Higher High Water (MHHW), etc. as defined in U.S.A. Tidal datums such as Mean Low Water and Mean Lower Low Water (MLLW) levels are usually used as chart datums in nautical charts for tidal water navigation. A geodetic vertical datum uses one or more fixed points as the starting reference for establishing a network of benchmarks or vertical control points. Tidal gauge station(s), although not a requirement, is usually chosen as the origin of the datum. As mentioned above the tide gauge MSL approximates the geoid zero surface. Starting from this origin, a control network for the vertical datum is extended over a region, a country or group of countries by geodetic leveling (differential leveling or spirit leveling). The network of control points is the realization or the implementation of the vertical datum. Surveyors can start from the closest reference marker (benchmark) to find elevations (orthometric height) of points of interest relative to the origin. Examples of vertical datums with a network of benchmarks include the North American Vertical Datum of 1988 (NAVD 88) which is the official vertical datum for the Conterminous United States and Alaska. NAVD 88 is fixed to the tide station at Father Point (Pointe-au-Pere), Rimouski, Quebec, Canada with a network of benchmarks across U.SA. Elevation values of the USGS National Elevation Dataset (NED) are referenced to NAVD 88 over the conterminous U.S. Prior to NAVD 88, National Geodetic Vertical Datum of 1929 (NGVD 29) was realized by fixing MSL to zero at 26 tidal gauge stations. Canadian Geodetic Vertical Datum of 1928 (CGVD28) is fixed to MSL at five tide gauges and is based on national scale adjustment of leveling made prior to 1928. This network of benchmarks has expanded and densified. Ordnance Datum Newlyn (ODN) is the traditional vertical datum for Great Britain. It is based on the MSL of the tide gauge (reading from 1915 – 1921) at Newlyn, Cornwall and a network of benchmarks across Britain. Leveling for establishment of vertical datums is very resource-intensive in terms of time, money as well as the need for highly trained surveyors. Due to its high accuracy (order of millimeters), leveling is practiced for measuring heights over short distances. However the piece-meal fashion of establishing a geodetic leveling network for the whole country can result in build-up of errors and distortions. Maintenance of the network of benchmark monuments and subsequent datum adjustments can be challenging and cost prohibitive. In some countries such as Canada, the network does not extend to remote and unpopulated areas. To use the reference datum for finding elevations at a place of interest, a monument needs to be physically located and leveling has to start from the monument. Monuments get destroyed or moved by a number of natural or man-made phenomena such as tectonic plate motion, frost, post-glacial isostatic adjustment, subsidence due to fluid withdrawal or sediment loading, road building, or vandalism. With the advancement of Global Navigation Satellite Systems (GNSS) such as GPS, Russian GLONASS, European Galileo, and Chinese BeiDou (Compass), in general there is a movement away from network of passive monuments towards network of active control stations. Some examples of such networks include U.S.A&apos;s Continuously Operating Reference Stations (CORS) in U.S., Canadian Active Control System (CACS), Canadian Base Network (CBN), and Provincial High Precision Networks (HPN) in Canada, Britain Ordnance Survey National GPS Network, and Euref Permanent Network in Europe. These active control networks, as opposed to passive monuments, do not require physical presence at the control station in order to be able to use the datum. In addition such networks can aid in monitoring and detection of tectonic motions, glacial isostatic rebound, subsidence, and sea-level change. Increasingly accurate gravity measurements, especially from global satellite missions such as GRACE and GOCE, have improved the accuracy and detail of geoid models of the Earth. As a consequence, specification of vertical datums and height measurements will be transitioning from geodetic leveling towards utilizing purely gravimetric (gravity-based) geoid models of the Earth that are compatible with GNSS. Examples of such projects include NRCan&apos;s Height Reference System Modernization in Canada and NGS&apos;s National Height Modernization Program as part of Modernization of the National Spatial Reference System in U.S.A. The geoid is the reference surface for determining elevations. Elevation of a surface or a feature is defined as the orthometric height (H) (also known as Mean Sea Level height), which is the height with respect to the geoid. GNSS technologies such as GPS directly measure the ellipsoid height, which is the height relative to the reference ellipsoid (e.g. WGS84). GPS receivers also use barometric pressure for altitude measurements. Geoid height modeling defines the geoid in relation to a reference ellipsoid. 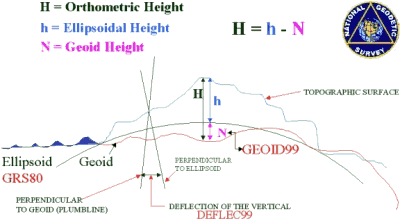 In other words the geoid height or separation (N) can be represented by geoid models. Knowing the ellipsoid height (h), the desired orthometric height (H) can be obtained by the formula: H = h – N.
As mentioned above, GPS receivers&apos; raw height measurement corresponds to the ellipsoid height. The newer receivers output orthometric heights, which are calculated by behind-the-scene conversion of ellipsoid heights via a table of geoid heights within the reciever. Due to storage limitations of GPS receivers, these geoid heights or separation values are not very accurate. Therefore the resultant real-time orthometric heights produced by the receiver are not of high quality. It is possible to derive the ellipsoid heights from the position data in the $GPGGA string (NMEA protocol) of the GPS output (example). Many national geodetic agencies provide software outputting geoid height based on position data (latitude, longitude) input, or converting ellipsoid height to orthometric height based on position data. Examples include: NRCan&apos;s GPS-Hv2.1 (using CGG2010 or HTv2.0 model) produces geoid heights for Canada; U.S. NGA&apos;s Earth Gravitational Model EGM2008 – WGS 84 version computes geoid undulation values with respect to WGS 84 ellipsoid; U.S. NGS geoid models convert heights between different datums; and Australia&apos;s AUSGeoid09 geoid model converts ellipsoidal heights to the Australian Height Datum (AHD) heights. Datums are adjusted over time due to new information from earth observations. New and improved measurements are performed, older coordinate values are updated and errors corrected. Apart form improved measuring techniques and data, natural phenomena such as tectonic motion (continuous and episodic such earthquakes), subsidence and glacial rebound affect positional accuracies and make such adjustments necessary. When there is a complete change in frame of reference, a new datum has to be defined; such was the case in moving from North American Datum 1927 (NAD 27) to NAD 83. However a modification or adjustment of coordinates in a network (network maintenance) does not necessitate a datum change, rather a new realization of the same datum is created by such adjustments. The realizations may also be referred to as versions or iterations. The datum name is followed by a tag in brackets representing a particular realization. Such realizations may be regional (e.g. state-wide, or fixed to a tectonic plate), country-wide or worldwide. An epoch date may be associated with coordinates of control network. This is a date for which published coordinates are considered valid, and it is usually expressed in decimal year format. For example an epoch given as 2006.35 indicates that mid-point of observations or measurements was on 128th day (0.35 * 365 = 128) of 2006, or May 8th, 2006. The NAD 83 datum&apos;s positions and velocities for all CORS sites were updated by NGS in September 2011. NAD 83 (2011) reference frame is realized with respect to fixed North American plate and is the appropriate datum for use in conterminous United States (CONUS), Alaska and US territories in the Caribbean. NAD 83 (MA11) frame is relative to the fixed Marianas plate and is the datum used in the Marianas. NAD 83 (PA11) frame is realized with respect to the Pacific plate and is used in Hawaii, American Samoa, the Marshall Islands and other US territories located on the Pacific Plate. The epoch for the 2011 adjustment is 2010.00; this means that the published NAD83 coordinates correspond to the control site positions at January 1, 2010. NAD83 (CSRS) is the realization of NAD83 in Canada (Craymer 2006). Two different epochs are used with NAD83 (CSRS), namely 1997.0 and 2002.0, depending on a particular provincial or federal survey agency. It should be noted that NAD 83 is not a truly geocentric datum; its reference ellipsoid is offset from the Earth&apos;s center of mass by about 2.2m. World Geodetic System 1984 (WGS84) is the native datum or reference frame used by GPS. Similar to the original NAD83, WGS84 was initially defined using Doppler satellite positioning system, and therefore the two datums were completely compatible with each other. In 1994, WGS84 was redefined using more accurate GPS measurements; the new realization was named WGS84 (G730) and was aligned with ITRF91 and thus became a truly global geocentric and dynamic datum. A new realization of WGS84, namely WGS84 (G873), was aligned to ITRF94 and introduced in 1996. In 2002, WGS84 (G1150) was adopted, which was aligned to ITRF2000. There is about a 1m to 1.5m coordinate difference between WGS84 and NAD83 datums. For recreational use (with low-end GPS receivers), such difference between the two datums can be ignored. However, for surveying and engineering work the choice of the datum and discrepancy between them should be considered. As mentioned, after 1994 WGS84 became aligned with the International Terrestrial Reference Frame (ITRF). ITRF is maintained by International Earth Rotation and Reference Systems Service (IERS), and is the most accurate geocentric reference system globally. As opposed to NAD83 which is fixed to a tectonic plate (depending on which realization), ITRF reference frame coordinates change constantly due to continuous tectonic plate motion (continental drift). Consequently position coordinates are valid only for a specific date (epoch). Coordinates can be calculated for any other epoch by taking into account velocities. North American plate (NAD83) moves about 2.5cm per year with respect to ITRF and WGS84. ITRF was initially defined in 1988 as ITRF88. ITRF is updated frequently with new realizations (e.g. ITRF-88, 89, 90, 91, 92, 93, 94, 96, 97, 2000, 2005, 2008), although there are only incremental changes between the updates (Craymer 2006). Horizontal Time Dependent Positioning (HTDP) software allows for estimation of horizontal displacement and velocities related to crustal motion in U.S. and its territories. It also enables updating of positions or observations to a specified date and transforming positions between reference frames (NAD83, ITRF, WGS84) and/or dates. In Canada NRCAN&apos;s CSRS-PPP (Precise Point Positioning) online service processes raw GPS by using a velocity grid to provide coordinates for a chosen epoch. It also applies HTv2.0 height transformation to produce orthometric heights compatible with CGVD28 Canadian vertical datum. NRCAN&apos;s TRNOBS transforms 3D geodetic coordinates between NAD83(CSRS) and all official realizations of International Terrestrial Reference Frame (ITRF). The datum should always be indicated as part of the metadata for any geospatial data or a set of coordinates. A location may have different coordinates (e.g. lat/long or utm) based on the chosen datum. The datum along with the map projection is usually printed on margins of maps. Care should be taken regarding consistency of datums when comparing or merging data from different sources, reading maps (paper or digital), using GPS, or using coordinates from outdoors guide books. Here is an example from coordinates of Mt. Shasta in California from its NGS datasheet. The coordinates are different depending on the datum and realization used.